China is expected to deepen its economic reform involving foreign companies in 2016 through reducing market access barriers and addressing the level playing field concerns of foreign enterprises, the US-China Business Council (USCBC) said in a report sent to the Global Times on Thursday. Much progress was made in 2015 in some areas, said the report. From ­mid-August to the end of 2015, the Chinese government rolled out several reform policies aiming to improve the domestic business environment, the report noted. 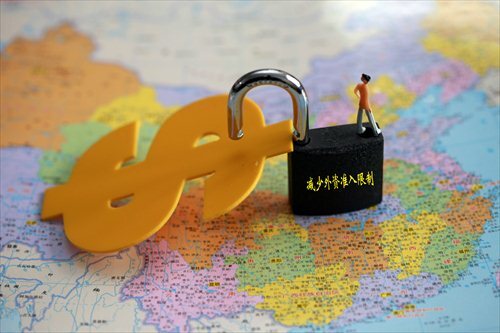 The State Council, China's cabinet, made commitments to initiate a nationwide negative list for investment management, simplify administrative licensing procedures, lift geographical limits for online insurance sales and encourage standards harmonization with international methods, the USCBC said. The "decisive role" of the market in shaping the economy was the key tenet of China's economic reform program announced three years ago, according to the report. Most recently, other core characteristics of China's reform objectives have emerged, including a managed slowdown in economic growth, a shift toward growth based on services and consumption rather than investment, and adoption of supply-side economic policies, the USCBC noted. "Supply-side structural reform will inject new power and energy into China's economy, stimulate the consumption engine and boost sustainable development," Doug Gurr, president of the online retail giant Amazon China, told the Global Times on Thursday in an e-mail. The huge market and unmatched consumption power of China will be further stimulated by supply-side reform, according to Gurr. However, the USCBC said, questions about the direction, scope and pace of China's economic reform were also raised as systemic issues affecting the US and other foreign companies in the country remain "largely untouched." For instance, several policies released during this tracking period called for "secure and controllable" technology in the medical device, insurance and information technology industries - an approach that will limit many foreign companies from participating in the market and feed concerns about the use of national security for protectionist purposes, according to the report. China has not fully opened its services trade (including medical services and insurance) with foreign countries as the relevant agreements are still under discussion, which is also true of other countries and regions in the global market, said Chen Fengying, a research fellow with the China Institutes of Contemporary International Relations. "But starting from 2016, the country will gradually bring in foreign investment in sectors like medical services and devices," Chen told the Global Times on Thursday. Access to the Chinese market will "certainly" be increased in the near future and foreign companies will see lots of opportunities for their China business, experts noted. The Chinese government is stepping up efforts to create a sound business environment for foreign companies and trying to further open up its market, according to Chen. For some industries whose markets are still immature in China, such as insurance, the country would also like to bring in foreign investment to improve the competitive ability of domestic insurance firms in the future, Chen said, noting that "the exact time is hard to tell." Among nearly 500 US companies that operate in China, 60 percent believe that China remains one of the top three investment destinations worldwide, according to a survey released in January by the American Chamber of Commerce (AmCham China). The survey did not list the other two top destinations. Innovation will be a business priority for most US companies when they seek development in China in the future, according to the report from AmCham China.